Junior High Band students from all Niles West feeder schools will meet in the auditorium all day Fri. Jan., 18 to study new music and be directed by a guest director, typically from a top ranking college or high school. The young students ranging from sixth to eighth graders will spend their day learning brand new music pieces which will culminate in 5:00 P.M. concert later that day. “They get to come and play with students that they don’t know, and play music at a higher level than what they’re used to at their schools,” Band Director Andrew Johnson said. The purpose isn’t to introduce them to how band classes are taught here, but more to get them used to working with other schools band students and learning more advanced music. In addition to that, Band Day is a good way of introducing them to their future band settings. “Back before I got here they didn’t have anything like this, and the high school director would just go down, [to the middle schools] take pizza, and talk to the kids and that was it. That was the only interaction they had with the high school. I thought it would be cool to have a musical experience that involved a guest director coming in and doing music with them for that day,” Johnson said. This year, four pieces will be taught to the students, who are thrown into the deep end at the beginning of the day; they’re expected to be concert-ready after eight hours of practice. This band boot camp can help the eighth graders decide if they’re ready for high school band expectations, with just two weeks to spare before they begin registering for their high school classes. Junior High Band Day has proven effective for some current members of the ensemble, who participated themselves years ago. “It was was a very good experience, it was beneficial and I enjoyed it a lot. I was pretty locked in [to joining the band at West] but it gave me extra reassurance and an understanding of how it’s going to work here,” Symphonic Band member and junior Edward Bryd said. This year for the first time, Johnson is also having his top ensemble — the Wind Ensemble — practice with the students all day. They’ll be there to answer any questions the band members may have and help them along the way. 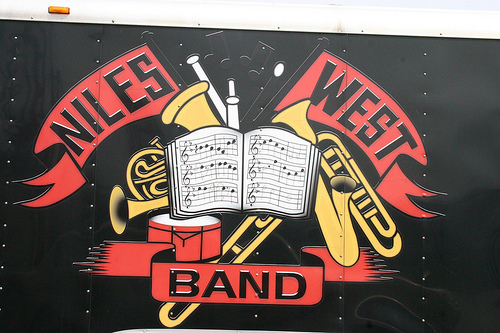 The concert will happen at 5:00 P.M. Friday night and is open to the public if you want to see the possible future members of Niles West Band perform.